Our modular pationt monitor can achieve modularization for function expanding with the help of integration plug-in technology, which can meet the requirement of updating and the monitors in all departments in the hospital. With various function, this machine can satisfy the convenient operation and the selection of all data of monitor in all departments in the hospitals. -ECG Waveforms of 7-lead displayed simultaneously. Baseline Recovery: < 3 S after Defi. Actualization interval: about 1 Sec. 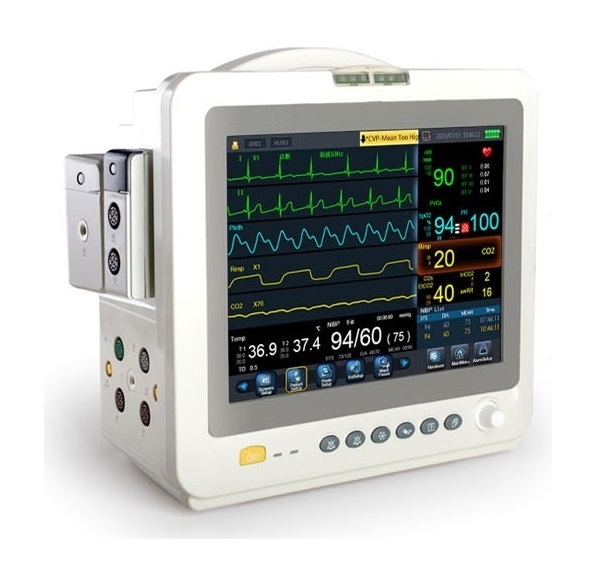 Optional Modular: Recorder, 2-IBP, VGA, ETCO2, AG (Anesthesia Gas), CO (Cardiac Output), 12-Channel ECG, Touch Screen, Wireless Function, etc.